ether you’re stuck indoors on a rainy day, or you know your babysitter is looking for ways to entertain before bedtime, we have the best indoor games for kids all in one place. Come and take your pick! If they need to let off steam, but need that energy channelled, make your own monster indoor car track using masking tape. Kids will love the challenge of ‘driving’ their cars around the home. Kids love Lego and they love marbles. 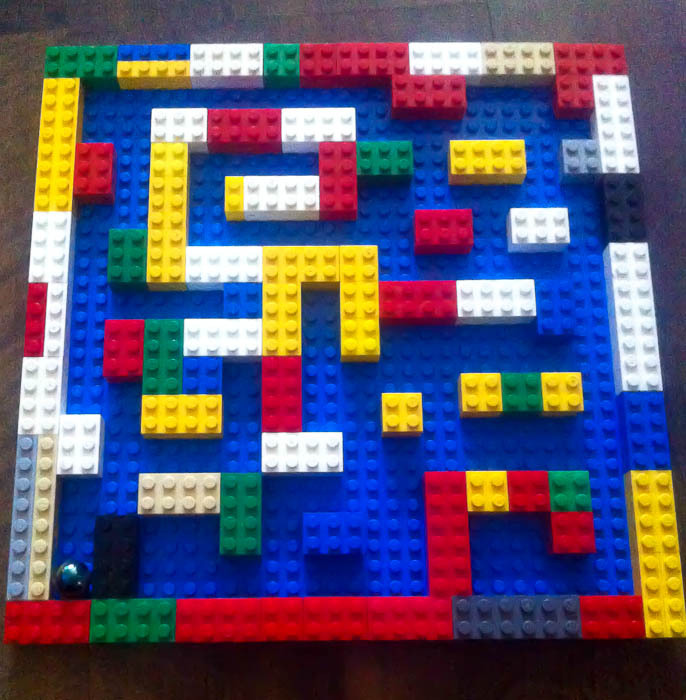 Combine the two by creating a Lego marble maze with them. It can be as simple or as complex as you like. Creating a challenge and a focus for their Lego building should keep them entertained for longer. Sometimes you just can’t beat the old-school rainy day activities. Get out the sheets and blankets, and use pegs, clothes airers, chairs and extension rods to create a perfect den for imaginations to run wild in. Another awesome way of channelling the pent up energy stuck inside on a rainy day, is to use some crepe streamers to create a ninja laser maze. Stick the crepe strips across a corridor or hallway and set the kids the challenge of getting from one end to the other without touching them! Indoor games for kids needn’t always involve resources or anything complex. A rainy day is the perfect time to sit down by the bookcase and get stuck into a new adventure or an old favourite. Kids love sharing stories with adults so give them this time and they’ll be happy. Give the toy dinosaurs another lease of life by making salt dough fossils. Simply follow the easy salt dough recipe here and then let the children have fun imprinting their favourite dinos. You’ll make palaeontologists of them yet! No, it doesn’t just appear in the packet like that! Wow them with a quick fun time in the kitchen by making their own popcorn. They will love the bang and pop and then it can either be enjoyed in their den or by snuggling up with a movie. Behaviour becomes a problem when kids are stuck inside without much to do. Get them focused by setting them up an easy treasure hunt around the home. Older children can follow written clues, but for little ones who can’t read, you can simply take a photo of the next place they have to find. Once they are finished, let them see if they can set a hunt for you too. Staying on the same theme, create a scavenger hunt that will see them heading all over the house on their quest to find the objects you’ve asked for. Items such as ‘a green sock’, ‘a teddy’, and ‘a bath toy’ are all ones that are simple yet effective. Don’t forget that tidying up is part of the game too! One of our favourite indoor games for kids is this sneakily challenging game. Stick down some lines on the floor using masking tape, get out the pompoms and some straws, and see if they can blow the pompom along the line. If little ones are getting frustrated, it can be best to make a wider ‘track’ of two strips of masking tape. Use being stuck indoors as an excuse to get out the glue and all the scraps of paper, card, and craft supplies to create a collage. Let their imaginations run wild and see what they create. Very few children gain the ability to use scissors properly without a helping hand. Print off some wiggly lines and encourage them to practice. A great tip is to put small dot stickers along the lines and their mission is to cut through the dots. One of the oldest games we know is a fantastic indoor game for kids. Ok, so you might not be able to find a thimble, but any small object will do. Decide how hard to make it depending on the age of the children, and then give them clues with ‘colder’ and ‘hotter’. Then get them to hide it for you. If you’re looking for an excuse to get little hands into the kitchen then they’ll love the prospect of making these ‘Show Your Spots Cookie Sandwiches’. Delicious, look great, and will be fun in the making. If they had eggs for tea or for breakfast, rinse out the shells and pop in some damp cotton wool. Sprinkle in some cress seeds and then decorate with some googly eyes. Put them on the windowsill and watch them grow! If the dismal weather is confining your adventures, then make the adventure indoor-sized. Use a tub to create a small world on a theme that will capture your child’s imagination. Under-the-sea, farmyards, roadworks and jungles can be created on a micro-level allowing for adventure whatever the weather. Get out the paints and create colourful butterflies. Simply fold a sheet of paper in half then put blobs of paint on one half. Carefully fold the paper over, then unfold and wow, a beautiful butterfly! Kids love craft that gives them something to show off. They’ll love making these paper bowl jellyfish which are incredibly simple, yet beautifully effective. Make the children the centre of attention by asking them to put on a show or a play. Let them either create their own storyline, or give them some pointers. Remember to be an appreciative audience! Instead of resorting to putting a movie on, get the kids in on the action. Using a phone or tablet kids can learn some basics of creating their very own movie. Use basic editing software, or simply film it in one hit. They’ll love being the star of the show.